GUINOBATAN, ALBAY - The old saying “Pag May Itinanim, May Aanihin” proved to be literally true in this municipality and in the other municipalities of the 3rd district of Albay which were mostly affected after the sleeping Mayon volcano has rumbled back to life. Since January 13, 2018 when Mayon volcano began spewing ash columns prompting authorities to evacuate thousands of villagers, a group of women from the Women for Progress Movement has been the first to donate their bountiful harvests of camote, pechay and other crops grown from their communal gardens to feed the evacuees. This group of women, mostly housewives from Oas, Polangui and Ligao City were organized way back in 2016 by Albay 3rd district representative Fernando Vallejo Gonzales. The congressman observed that these women used to be doing unproductive activities such as gambling, gossiping or simply doing nothing while their husbands who are either farmers or fisherfolks are busy working. Thus, in partnership with the Department of Agriculture in Bicol, Cong. 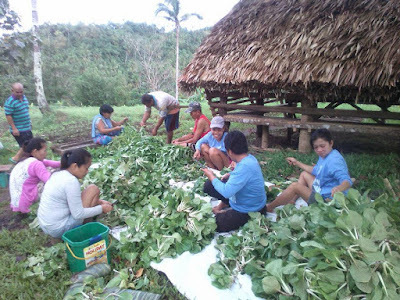 Gonzales’ office and the City Agriculture Office of Ligao City organized the women, made them participate in crops production training and food processing and provided them with vegetable seeds and farm tools. Evelyn Ragos, president of the Women for Progress Movement confirmed that their group now has 80 chapters in all the barangays of the three 3rd district municipalities, namely Polangui, Libon, Oas, Ligao City, Pio Duran and Guinobatan. Months before, Rosita Imperial, DA regional High Value Crops Coordinator provided 300,000 cutting of sweet potato, 30 kilograms vegetable seeds and 25 kilograms garlic bulbs. During the first provincial sortie or Byaheng Bukid of Agriculture Secretary Manny Piñol in Ligao City in March 2017, the DA Bicol though its High Value Crops Development Program turned over 60 kilograms vegetable seeds, 100 sets garden tools, 100 bags organic fertilizers, 500 pieces assorted fruit trees seedlings, and 100 kilograms mungbean seeds. Through their collaborative efforts, the Women for Progress Movement has established a total of 80 communal gardens with a minimum area of 500 square meters in the barangays of the third district of Albay. Cong. Gonzales in his facebook account shared his appreciation to the women whom Cong. Gonzales’ described as “good hearted and caring women.’’ They selflessly shared their harvests consisting of vegetables such as pechay, gabi, upo and rootcrops such as camote and cassava to the evacuees in Guinobatan. Cong. Gonzales and the women personally distributed the goods to the evacuees at evacuation sites in Villa Mercedes, Mauraro Elementary and High School, Libas, Itago, BUCAF, Guinobatan East High School, Lower Binogsacan Elementary and High School, Inascan, San Jose and Bubulusan. 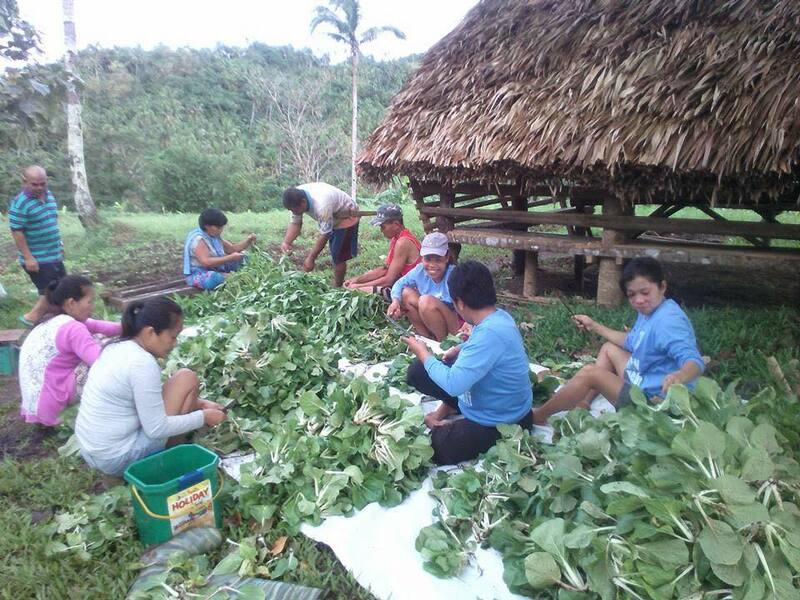 The women are now eagerly preparing their communal gardens for a new planting season after sharing their harvests to the evacuation centers. They planted eggplant seedlings this time. Cong. Gonzales’ provided them with eggplant seedlings grown in plastic trays to lessen mortality. The DA HVCDP also provided vegetable seeds, garden tools and sprayer during the recent visit of Sec. Piñol in the town of Guinobatan. Guinobatan along with the towns of Camalig and the city of Ligao are located at the foot of Mayon and have barangays within the 8-kilometer danger zone. These areas are affected by the ash fall because of the westward director of the wind. The continued seismic activity of the volcano has covered the municipalities of Camalig, Guinobatan, Ligao City and other areas in Albay 3rd district in ash while nearby towns including the 5th district of Camarines Sur are being choked with ash, which has been thick enough at times rendering zero visibility for the motorists travelling particularly the main highways connecting Camarines Sur to Legazpi City. In her partial report submitted to DA Central office, DA Bicol regional executive Director Elena B. delos Santos reported that 9,791 farmers have been affected with a total production loss valued at P185,278,079.